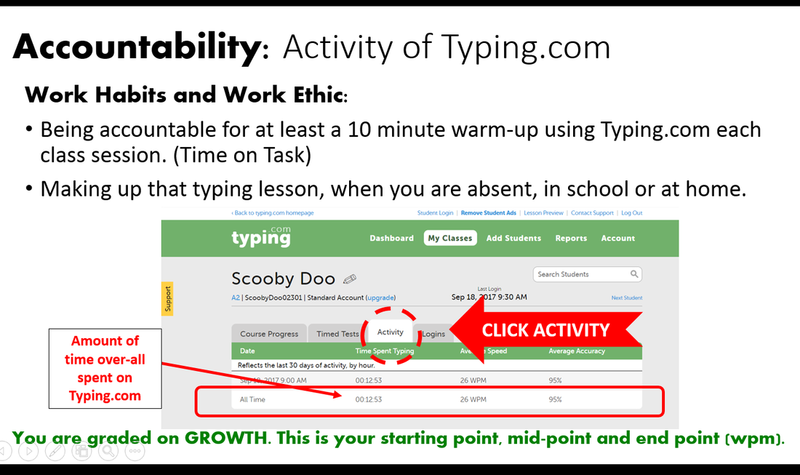 YOU WILL FAVORITE/BOOKMARK Typing.com for easy access each class period! How to Sign Up and Create a Student Account on Typing.com. View the image BEFORE clicking the button to join. check your overall Activity Time. Below is the TEACHER VIEW of your account. This is how you are assessed and graded for the Keyboarding portion in the first half of the Semester. Activity of All Time. WPM Scores, and Accuracy are Assessed. If you are falling behind make an effort to catch up after school or during Directed Academics (study). See me for an Academic Pass to an IRC or my lab for use of a PC there to make up Typing Time. My Lab - check for availability with me. ​Activity of All Time (Term 1 Assessment). WPM Scores, and Accuracy are Assessed. Students will be assessed by time on task. Term 1 students should have completed at least ________ hours of typing which was the equivalent of 10 minutes per class session. ​See Rubric Above for grading assessment. Term 1 Ends November 8th - You will be give a GOAL of Accumulated Time. ​8-page guide for Teachers & Students.